The stats panel shows you the most important stats for your video from the past 30 days, helping you track performance and see how viewers are engaging with your videos. 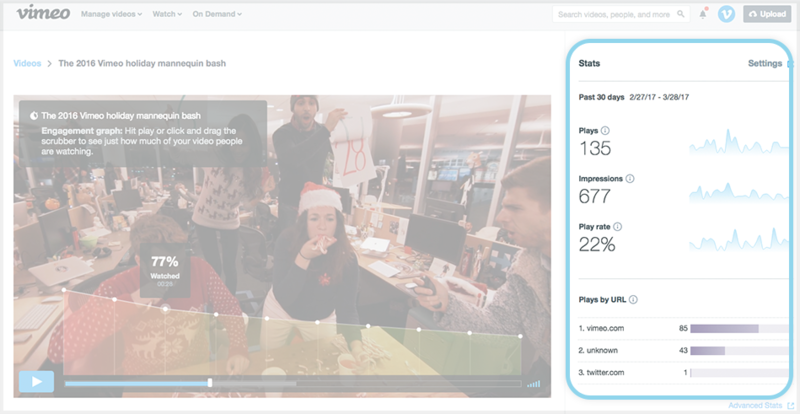 You can navigate to the stats panel for any of your videos from the Video Manager. Hover over the row of the desired video and click the Stats icon that appears. Plays: See your video’s total plays for the past 30 days, or click the section to reveal a graph with your plays broken down by day. Impressions: Have a look at your video’s total loads for the past 30 days (or, as above, click the section to reveal a graph with your loads broken down by day). Play rate: This number is simply your video’s plays divided by its impressions for the past 30 days. Plays by URL: See where viewers watch your videos to help determine where your videos are performing best. Engagement graph (PRO + Business only): Hit play, and see the exact places in your video where viewers are most engaged, and where they’re dropping off. Interaction tools stats (Business only): Track the performance of your video’s email capture screen, cards, and calls-to-action end screen. You can also navigate to your full Advanced Stats dashboard or your video settings from the stats panel. The play rate for your video is simply your plays divided by your impressions. We count an impression every time the Vimeo player loads your video, either on vimeo.com or embedded, and we count a play every time someone hits the play button on your video. If you’re only sharing your video with a select group of people (for example, a wedding video sent to friends and family), it’s likely that your play rate will be relatively high, because your video is only exposed to people who have a strong interest in watching it. If, however, your video gains a lot of exposure (for example, through being Staff Picked or embedded on a popular site), it will rack up a ton of impressions, which may dilute your play rate significantly. Please note that we don’t display the play rate for your videos publicly. The plays by URL section shows you where your video has received the most plays in the last 30 days. Plays by URL are grouped together by domain. For example, the plays through your Vimeo video page and review page both count towards the total plays from vimeo.com. When we record a play on your video but are unable to determine the website where it originated, we count it toward your plays by URL under "Unknown.” If you've set up domain-level privacy, we can assure you that any stats listed as "Unknown" are only coming from the domains you've chosen to allow. PRO or Business members have access to the the engagement graph for their video on the stats panel. The engagement graph shows you the percentage of viewers who made it to specific points in your video by recording the maximum timestamp we were able to detect for each viewer (within a single browser session). This graph will usually show a downward slope, but if all of your viewers watched the full video the graph will be a straight line. The engagement graph does not account for parts skipped in between these points or viewers who scrub back to rewatch parts of the video. If you have email capture, cards, and/or the call to action end screen enabled on your video, you can check the performance of those tools on the stats panel.